The Lord of the Rings: The Two Towers is a 2002 fantasy adventure film directed by Peter Jackson based on the second volume of J. R. R. Tolkien's The Lord of the Rings. 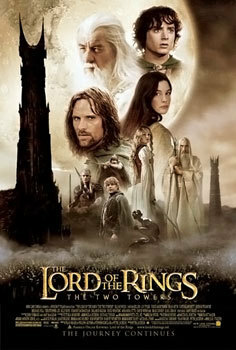 It is the second film in The Lord of the Rings film trilogy that was preceded by The Fellowship of the Ring (2001) and concluded with The Return of the King (2003). On the reviewer aggregate website Rotten Tomatoes, the film has a 96% "Certified Fresh" rating, along with an average score of 8.4/10. It also has a 100% "fresh" rating when narrowed to only professional critics. The Battle of Helm's Deep has been named as one of the greatest screen battles of all time, while Gollum was named as the third most convincing computer generated film character by Entertainment Weekly in 2007.
o Winner: Visual Effects, Sound Editing. o Nominee: Best Picture, Best Art Direction - Set Decoration, Best Editing, and Best Sound.